What does a speaker tell a group of economic developers? How important economic development is, of course. 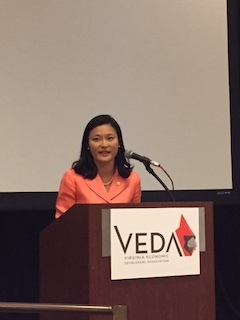 That theme was constant in remarks from Esther Lee, Virginia’s new secretary of commerce and trade, during a keynote address Thursday to the Virginia Economic Developers Association (VEDA). About 220 people attended a luncheon at the Westin Hotel in Henrico County, site of a three-day conference sponsored by the VEDA. In one of her first major public appearances since being appointed by Gov. Ralph Northam in January, Lee — formerly the vice chair of the Fairfax County Economic Development Authority and a senior policy adviser to the U.S. secretary of commerce under President Barack Obama — highlighted some of the goals of the new administration. In the past three months, Northam’s administration has announced 35 economic development projects, representing $440 million in capital investment and nearly 22,000 jobs created or saved. “That’s $40 million more than Gov. McAuliffe had at this same point in his term,” Lee noted. Despite this “impressive” list of early successes, she said, Virginia still has a ways to go to reclaim its top ranking. That’s why Northam has restructured some of the building blocks of economic development, creating, for instance, the position of chief workforce development adviser and elevating it to the cabinet level, Lee said. Filling that position is Megan Healy. Northam’s team has hired Cass Rasnick to serve as a deputy secretary of commerce and trade for rural economic development. Northam does not have a secretary of technology in his administration, Lee said, preferring to put the agencies formerly in that secretariat under the oversight of the secretaries of administration and commerce and trade. That means that the state’s Center for Innovative Technology in Fairfax County is part of Lee’s team. The CIT plays an important role, she added, in helping Virginia support entrepreneurs and startups. “In the last 30 years, nearly all net new jobs in the U.S. were created by startups,” she said, noting that Virginia needs to develop this sector of the economy. Lee praised GO Virginia, a new organization providing state funds for regional growth and economical diversification projects, as “ a big step in the right direction.” So far the GO Virginia Board, on which she sits, has funded projects in three primary categories: workforce, infrastructure and commercialization. Lee said it is time for public and private stakeholders to agree on a set of broadband goals for the state, with Virginia creating a clear set of metrics to evaluate access, upload and download speeds. A good example of the type of collaboration that leads to progress can be found in Southern Virginia, Lee told the audience. The Virginia Tobacco Commission, Mid-Atlantic Broadband and Microsoft worked together on a project that utilizes unused portions of television broadcast spectrum to provide high-quality wireless broadband. The group was able to connect about 1,000 households last year. Lee also stressed Virginia’s strong economic development assets. The state is home to 23 Fortune 500 companies. It also has the Port of Virginia, one of the busiest and deepest ports on the East Coast, and more than 70 percent of the world’s internet traffic flows through the commonwealth. “Did you know that every car in the world has a memory chip produced in Virginia,” she asked? The Washington, D.C., metro area also produces more digital tech-related degrees and certificates than any other region in the U.S., including Silicon Valley, she said. At times, she added, “it has felt like a beauty pageant.” In fact, this week the governor made a cameo appearance in the new season of “The Bachelorette” being filmed in Richmond, because “he thought it would help us ‘get the rose” from Amazon,” Lee joked. The episode will run on July 2.